Sometimes, the problems are relatively minor, and require only minor corrective pruning, but other problems are more serious and require multiple pruning sessions, spread out over several years, to correct. Most of these mistakes occur because one of two basic mistakes was made: They either make improper cuts or they place their cuts in the wrong places. By avoiding these mistakes, you can save yourself some time, money and heartache in the future. Note that the term “amateur??? may even apply to those who charge for their services. Anybody with a chainsaw and a truck can call themselves a tree-care professional, but only educated, experienced and skilled professionals attain TCIA and ISA accreditation. Every cut made on a tree is an assault, exposing it to infections, pests and decay. When these cuts are made cleanly and close to the branch protection zone, the tree can compartmentalize the wound more quickly than fungi and other invaders can take hold. However, if pruning cuts are made several inches from this zone, compartmentalization cannot proceed quickly enough to protect the tree. Another problem occurs when amateurs try to remove large branches with a single pass of the chainsaw. This often results in the branch falling to the ground before the saw passes completely through the wood. When this occurs, part of the bark often remains attached to the falling limb. As the limb falls, it rips off a large swatch of the trunk’s bark, thereby leaving it naked and exposed to the elements. To prevent this from happening, arborists use the three-cut technique, which slices through this layer of bark before cutting through the top side of the branch. Even if the cuts are made with perfect technique, trees can suffer great harm if these cuts are not placed in the correct places. In contrast to poor cuts, which often harm the tree by exposing it to pathogens, poorly placed cuts are more likely to compromise its structural integrity. Topping is the most flagrant example of poorly placed cuts. All cuts should be placed in close proximity to a branch node; internodal cuts often lead to decay. Topping not only features an arbitrarily placed internodal cut, but this cut is made to the tree’s central leader. Lions-tailing is another common problem arborists are tasked with repairing. Arborists use the term lions-tailing to refer to the inappropriate removal of a tree’s inner branches. The lack of inner branches and leaves exposes the trunk and large branches, leaving them vulnerable to sunscald. Additionally, the practice disturbs the balance of the canopy, predisposing the tree to wind throw. 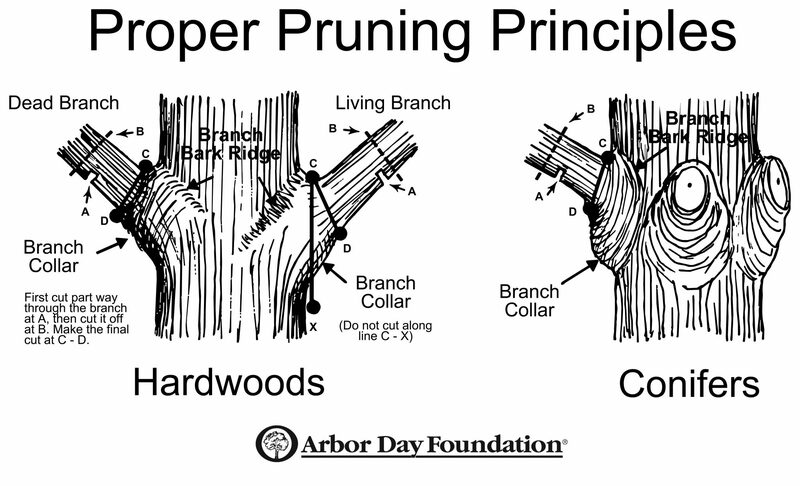 In the end, it is pretty simple: Make the right kinds of cuts and put them in the right places, and you can prune trees like a pro. Of course, it is always easier to avoid all of these problems and simply hire the best tree cutters in San Francisco at the outset. If you find yourself in need of tree pruning services, contact Arborist Now without delay, and let us keep your trees looking their best.